Otter House was originally created as a boathouse with outdoor sleeping and picnic space above, by Jack and Nadine Mar with their good friend Ernie. Cleverly nestled among cedar trees, Otter House is a comfortable space with a gas fireplace supplemented with electric heat. 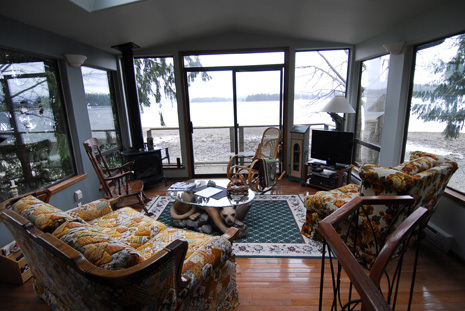 The warm living room is open and bright with natural light from several large windows and skylights which provide views down to the beach, out towards Rebecca Spit, the outer islands and the coastal mountains. Enjoy the fresh air sitting outside on either the upstairs or downstairs porch. 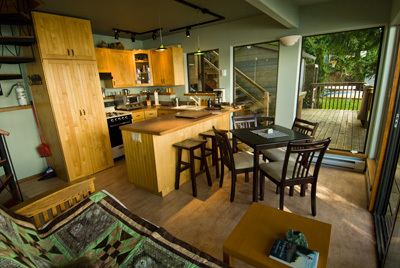 Otter House is a welcoming cabin with full amenities and a spectacular view; enjoy the sauna and outdoor shower, and take a beach walk from the front patio. Venture not far down the road to enjoy Heriot Bay or Rebecca Spit Provincial Park. Otter House was built with care and is tended to with mindfulness, ensuring a wonderful experience for neighbouring islander or world traveller alike. This cabin with a story is a special place for the creation of new stories. With many windows and skylights, feel the benefits of being in the tree canopy and observe the birds off the cabin's doorstep in their Pacific Northwest home. Otters, Herons, Scoters, Pacific and Common Loons Harlequins, Mergansers, and Eagles make their homes in Drew Harbour and Heriot Bay and the nearby bird sanctuary at Mittlenatch Island Nature Provincial Park. Otter House is an ideal resting space and an inspired planning place for the many activities at its doorstep. 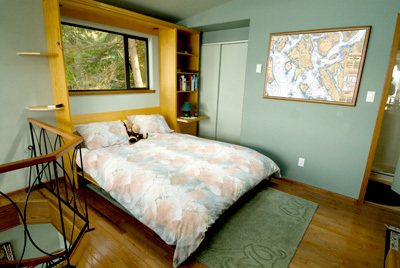 With its many natural highlights, Otter House will enhance any Quadra Island visit. Downstairs by way of the spiral staircase, is a full kitchen with hot water, cooking facilities and two small fridges. Enjoy the seaside sauna and outdoor shower with a stunning ocean view. The cabin comfortably sleeps four; two people in the upstairs Queen size "Murphy's Bed" and two in the downstairs Queen size futon. 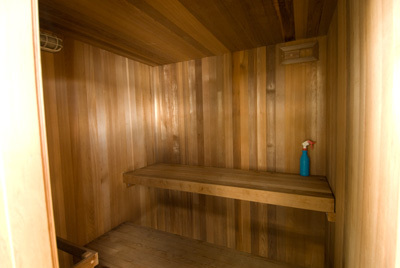 A Sauna is for you to relax in after a day of...relaxing. 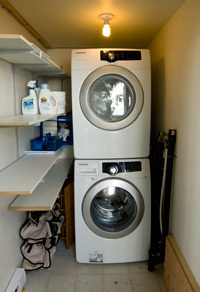 You are welcome to use the on site washer and dryer. 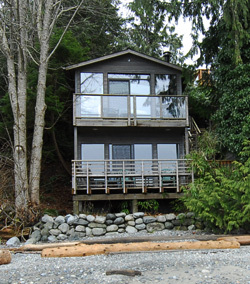 The private seashore cabin is on the lower level of our home property and is the only beach cabin along the inner harbour for 400 m. Access to the cabin is to the right of the main house and down a series of stairs with an entry way to the upper level midway. Further down a few more flights of stairs, you will arrive on the main deck with access to lower cabin, sauna, wash shed and a private lawn and patio. Kayaks, canoes and other hand carried water craft can be transferred to the beach level and launched from and stored on the lawn. Inside, a spiral staircase joins the upper and lower levels. Otter House is truly in a perfect spot. On the beach in Drew Harbour, but off the road so you feel away from it all, it's a simple venture to the Heriot Bay downtown village. Islanders gather at Heriot Bay Inn to enjoy the historic Pub, Restaurant and local hangouts, dance and sing in different venues, or pick up burgers at the local outdoor diner. Explore the different shops, or head the other direction and have the perfect picnic at Rebecca Spit Provincial Park, created over a few thousand years by currents off the south end of Quadra Island.